The core of this function is Power regulator is produce fix linear 5 volt power supply using 7805 IC for this Arduino project. I also using 100uf and 0.5uf Capacitor IN and 10uf OUT to reduce power noise so all analog and digital signal from and to Arduino is good enough. You can arrange the placing of the component on the PCB so that you can get the smallest size as you can for this unit. After you have the power regulator unit, next phase is to connect between Power Regulator, Arduino Mini pro, Gyro+Acclero Sensor and Servos. But before you can work with Arduino Mini Pro, please don’t forget to attach the communication pin on it. So after that you can programing it through this pins. 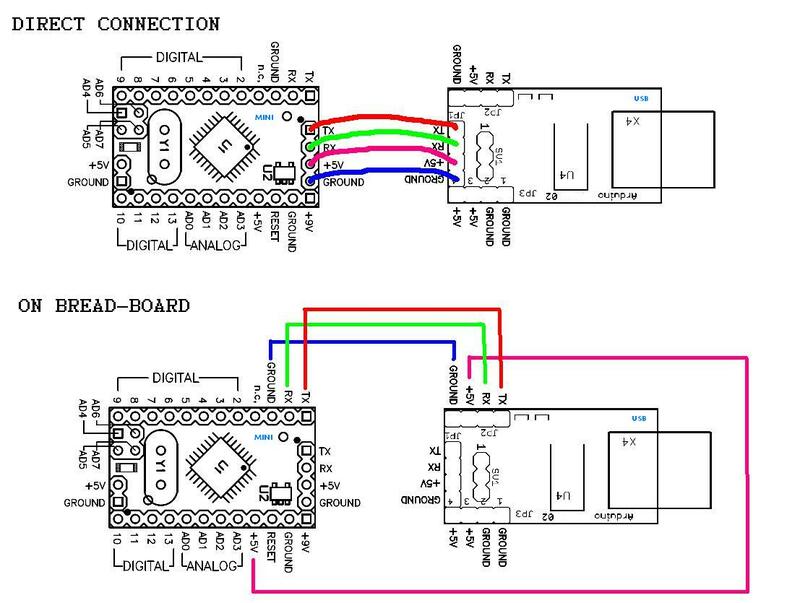 OK, Now connect the VCC hole on Arduino Mini Pro to (+)5V DC out from Regulator Unit, and GND hole on Arduino Mini Pro to Ground using sort cable. For VCC 11,1V and Ground from Battery to Regulator Unit, you can use a longer cable and soldering it later on VCC and Ground spot on AR.Drone Mother Board. After you have all connected part, now you have to make some holder to hold the servos on their position. 5. Using aluminum plate, bend and cut some edge and make a shape like figure above. Then attach the servos in it and you can use cable ties to ties servo Y in the place. The last thing you have to soldering is this part. Now you have to connect the servos to the servos socket from the arduino. First, cut the original socket from both servos, then bind the brown cable from Y servo and X servo as one and solder it to the pin 1 then repeat this step for red cable to the pin 2. After you sure with the connection now you can replace the dummy camera (if you using dummy camera for previous step) glue it to the servo bracket. Then hot glue the sensors on top of the camera.